There is only a small risk to sterling from any political uncertainty following Britain’s national election tomorrow, according to over a half of the foreign exchange strategists questioned by Reuters in the past week. Sterling forecasts were left relatively unchanged. Similarly, economists still say they expect the Bank of England to hold off on raising interest rates from their record low until early next year as it waits for inflation to pick up. Tomorrow’s ballot will be one of the closest fought in decades but still 17 of 31 strategists said the outcome posed little risk to their forecasts. Three said there was none and the remaining 11 said there was a major risk. “A hung parliament is being already discounted. As such this should not harm sterling so much,” said Asmara Jamaleh at Intesa Sanpaolo. Prime Minister David Cameron’s Conservatives were level with the opposition Labour Party according to a Populus poll published on Tuesday and most opinion polls suggest neither will win enough seats to secure an overall majority. But even as the election looms, forecasts for sterling were little changed from an April poll. Cable, trading around $1.51 on Tuesday, is set to weaken to $1.50 in a month and then to $1.47 in six months where it will be a year from now. Sterling has only lost around 3.0 per cent against the dollar this year, with the bulk of those losses last week following weak manufacturing data. Currency speculators, while still short on the pound, actually reduced negative bets last week. The pound has been far more resilient than the euro, which has tanked around 8.0 per cent. 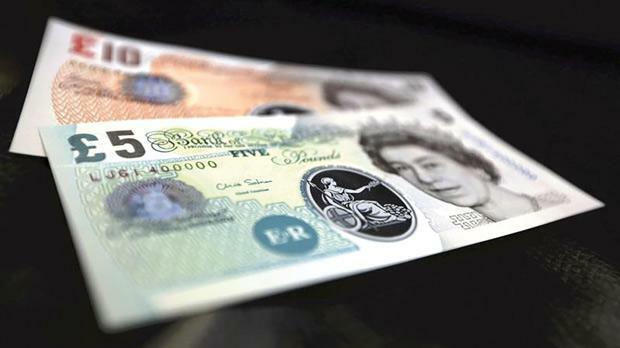 Against the common currency, the pound will gain ground, according to the latest survey. One euro will get you 73.1 pence in a month, 71.0p in six and just 69.8p in a year. It was worth around 73.3p yesterday. The euro was hit in the run up to, and implementation of, the European Central Bank’s trillion-euro bond-buying stimulus programme which is due to run through to September 2016. In contrast, the Bank of England is expected to raise interest rates from their record low of 0.5 per cent early next year, likely trailing a Fed hike pencilled in by economists before end-September. “It would be a surprise if rates remain on hold much beyond the end of 2015,” said Peter Dixon at Commerzbank, who predicts the first Bank Rate hike will be in early 2016. Expectations as to when Britain’s Monetary Policy Committee finally pulls the trigger have gradually moved back in Reuters polls but they have been consistent in saying any rate increases would be gradual. Bank Rate will stand at 1.25 per cent by the end of next year and a still historically low 2.0 per cent at end-2017. There was a median 32 per cent chance of a hike by the end of this year but a more certain 75 per cent chance by the end of next year. None of the 60 economists polled expect a move on May 11. “Even setting aside the issue of the election, there are few reasons for the Committee to change rates,” said Vicky Redwood at Capital Economics, who doesn’t expect any action for another year.